The Indian Football World Cup Follower, note how he is different from your average Indian Football Fan, is a strange yet fascinating sub species of the homo sapien. Its affinity for the beautiful game usually reaches a peak during a World Cup year. It makes its presence and opinions known on various social networking sites and more often than not has no more than a passing interest in football otherwise. Okay jokes apart, watching the FIFA World Cup 2014 brought to you live from Brazil by Sony Six in India this year is a hard task. There are several reasons really: the time difference, the World Cup Song Album, Cafe Rio, oh and did I mention, time difference? But most unfortunate souls trudge on and stay awake (amidst empty Coke cans, beer bottles and Lays World Cup flavoured chips packets) for the entire night in the hope of catching a Messi, a Neymar or a Rodriguez or a Cahill score a brilliant goal, and more often than not, turn up at their work place at 9 am that day looking and feeling like something a dog vomited out. If you don’t believe me, take a look at people in your office or school or wherever it is you go everyday at 9 am. Then again, we manage to adjust. Yup, it is our country’s mantra, after all, isn’t it? Like that advertisement said “adjust maadi”. Suddenly everyone around you becomes a football expert. You hear interesting debates and mind blowing theories on everything from the excessive number of goals scored in the prelims to Suarez’s fetish for human flesh to Ghana’s ship of money and how the Mexican goalkeeper reminds them of Ted Mosby. That annoying group of kids in your colony who used to play cricket till about a month ago suddenly sport Messi/Neymar/Xavi jerseys and kick a football around, blocking the road in front of your house. You may get annoyed, but then again you realise that is only a quadrennial phenomena. When you watch the commercials during match time, you’ll see that almost all companies, ranging from those selling noodles to phones or even motorcycles make football related advertisements during this time. And then you realise that the ‘Brasuca’ is made in Pakistan. Lovely. There is just over a week left. So tolerate the kids, the commercials, Cafe Rio, and Pittbull’s music, and most importantly don’t forget to enjoy the football, after all this happens only once every four years. 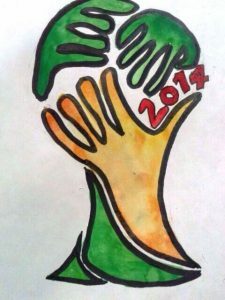 Happy World Cup Finals to You!